Returning for the seventh year, Newquay Beer Festival will be back this September, bigger and better than ever. With a new site layout at the five-star Hendra Holiday Park, more undercover provision, two music stages and over 100 beers and ciders (at least 50 of each), the family and dog friendly festival is sure to raise a smile. The musicians who give the event such a buzz all play free of charge to help the organisers, Newquay Towan Blystra Lions Club, raise as much as possible for local charities and good causes. Already, regular Friday night favourites, The Qwest, have confirmed they will be there and other acts over the weekend will be posted on the festival website, Facebook and Twitter as they are announced. This must be the best value festival around with a three-day entry ticket bought in advance costing just £15 and the opportunity to stay on-site in your caravan, camper or tent from only £7.50 per pitch. In fact, if a couple want to come along and stay for four nights (Thurs-Sun), the total cost for the pair would be just £60 (or £67 with an electric hook up) including full access to the festival. Newquay Beer Festival has raised over £40,000 for charities and good causes since it started in 2013. Over 100 supporters helped fund the festival in 2018 and there are some superb sponsorship opportunities available for local businesses and individuals to get involved this year. These are all shown on the website and start at just £30 for a festival programme advertisement, with the most popular option being the sponsorship of a barrel of beer or cider for £100. All sponsors receive complimentary tickets and barrel sponsors and above also receive some free drinks as an additional ‘thank you’ for their support. 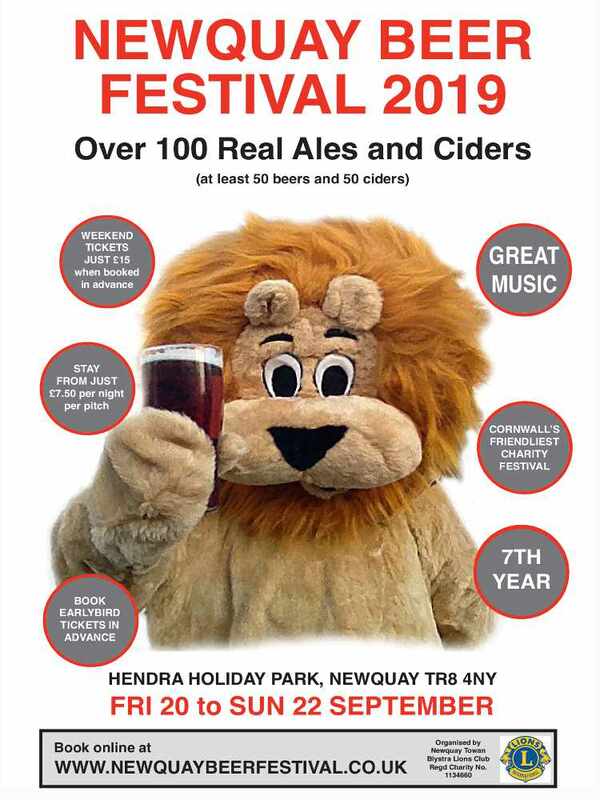 All tickets for entry to the festival which runs from Fri 20 to Sun 22 September, including camping can be booked at www.newquaybeerfestival.co.uk and expressing interest in becoming a sponsor can also be done online. Any telephone queries can be made on 0845 833 4981.